It could happen... 2014 Topps Tribute is due in Friday at Sports Cards Plus, a.k.a. The Super Hit Factory. Come on in. Pick your box from THE BEST CASES in The Hobby, pull your Super Hit and get it graded by Beckett Grading on the spot. Beckett Grading will be conducting a Raw Card Review (Grading cards while you wait) at Sports Card Plus, Saturday from 11 a.m. to 6 p.m. and Sunday from 11 a.m. to 4 p.m.. They will also offer HUGE DISCOUNTS when you submit your cards for grading ($2 per card OFF their posted rates). The more cards you grade, the more you save. At Sports Cards Plus, you always get more! 1. HUGE SALE: All boxes are about as LOW, LOW, LOW as you will find them anywhere in THE UNIVERSE. 2. WIN $500.00 at Sports Cards Plus. Every time you make a purchase over $20 you get a ticket matching the amount you spend. On February 28th we will keep pulling tickets from our jar of tickets until we reach a total of $500.00!!!! 3. Buy ANY BOX of 2012-13 Panini Basketball Product and pull a FREE TICKET from our box. If that Ticket matches one of ELEVEN numbers on our list, YOU WIN A FREE SPOT TO A 2012-13 NATIONAL TREASURES GROUP BREAK. Your FREE SPOT guarantees you ONE Random CARD from Factory Sealed National Treasures box. WIN Prizes: 1) Evan Turner Autographed 8"x 10" Photo from Panini, 2) Two people win ONE Box of 2012-13 Innovation Basketball, 3) Four people win ONE Pack of 2012-13 Absolute Hobby Basketball, 4) Thirteen people win 3 Packs of 2012-13 Brilliance Basketball. 5. Get FREE TOPLOADERS for your autographs and relic cards when you open your purchased box in our store. 6. BE A PART OF SPORTS COLLECTING HISTORY. 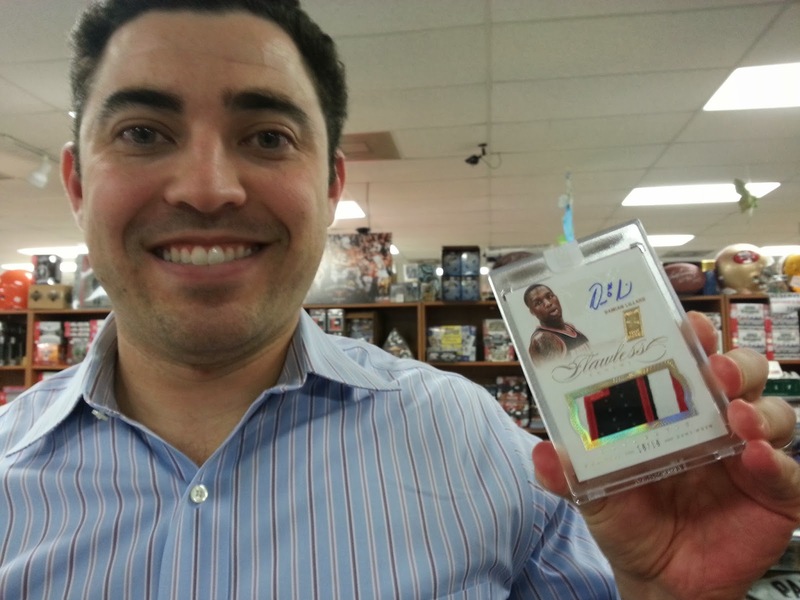 While Beckett Grading is Here, we will conduct a 2012-13 FLAWLESS BASKETBALL GROUP BREAK! Slots are $239 each. Each slot WINS ONE RANDOM FLAWLESS BASKETBALL CARD! .... And, get a FREE Magnetic Holder for your Flawless Treasure. So, what are you waiting for? Don't be the guy who says, "That could have been my picture." Come to Sports Cards Plus, a.k.a. The Super Hit Factory. Pick your box from THE BEST CASES in The Hobby at our LOW, LOW, LOW Prices and get your Super Hits graded by Beckett Grading. Come on in and have some fun!